If a 6 star qualification would exist, this house would certainly deserve all 6 of them. Newly built in 2006, here you can enjoy your own private welness area with sauna, relax area and bubble bath from which you can even watch TV. The villa has a spectacular location and is blessed with a breathtaking, unique view of the Ossiacher See. 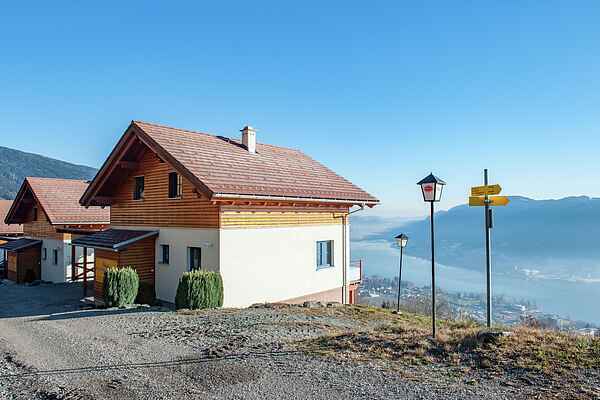 The villa covers no less than 160 m2 pure living enjoyment, it has several balconies and a panoramic view of the Ossiacher see and the surrounding mountains from almost every corner in the house. All rooms have a luxurious interior, wireless internet anywhere in the house. The fireplace in the living room provides warmth and a cosy ambiance on a chilly evening. In the morning you can have breakfast on the spacious balcony, in the afternoon you can relax in the sauna or bubble bath and in the evening you can enjoy a barbecue in the garden. All in all a top villa for bon-vivants!! Specifics: Sandwich service; Baby sitting service in the high season.